How to get there: Girley Bog is 8km south west of Kells and can be accessed from the N52. Parking is available at the trail head for the Girley Bog National Loop Walk around the bog which is signposted from the N52. Please note that for your own safety the Loop Walk is closed since April 2018 as the trail is partially flooded and in need of maintenance. Read about the steps involved in the ecological restoration of bare peat on cutover bog at Girley Bog NHA, Co.Meath 2018 using the Sphagnum transfer method. 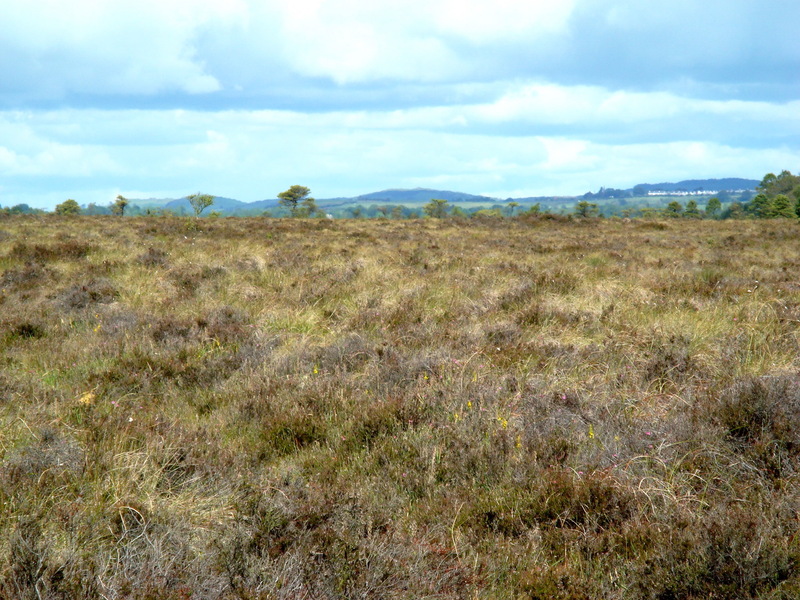 Girley Bog represents the eastern extreme of the range of raised bogs in Ireland. Raised Bogs are dome-shaped bogs which have developed in former lake basins in the midland counties of Ireland. At the end of the last ice age, about 10,000 years ago, the central lowlands of Ireland comprised of many large shallow lakes. These lakes gradually became totally overgrown with vegetation that slowly accumulated into peat. Bog mosses (species of Sphagnum) began to grow on this unique water-logged environment. These bog mosses soaked up rainfall like a sponge and over the millennia the bog mosses accumulated to a depth of up to 10 metres (30feet) creating the peat that now forms the ‘high bog’ part of Girley Bog. The living carpet of Bog Mosses that cover the surface of Girley Bog is between 10 and 50cm thick. As the mosses grow they form a series of small cushions called hummocks, flat areas or lawns, depressions called hollows and pools. After heavy rain the hollows fill with water to form temporary pools. The hummocks and hollows are quite different habitats and attract their own particular communities of plants. Species that prefer slightly drier conditions on the bogs such as the different Heathers are found growing on the hummocks while species preferring wetter conditions such as Sundews grow in the damp hollows or pools. Species that can tolerate both wet and dry conditions at different times grow in the lawns and at the edges of pools. Different species of Bog Moss or Sphagnum construct the hummocks and lawns or line the hollows or grow submerged in small pools. So the Bog Mosses form a living growth pattern all over the surface of the bog. The most obvious plant species on the bog is Ling Heather (Calluna vulgaris) and in the wetter areas Cross-leaved Heath (Erica tetralix) is also found. However, on closer inspection there are a host of other species including Hare’s-tail Cottongrass (Eriophorum vaginatum), Cranberry (Vaccinium oxycoccus) and Bog Rosemary (Andromeda polifolia). In the wettest parts of the bog there are several species of bog mosses. These bog mosses can form dense cushions or hummocks, flat lawns or they can line hollows or fill pools. 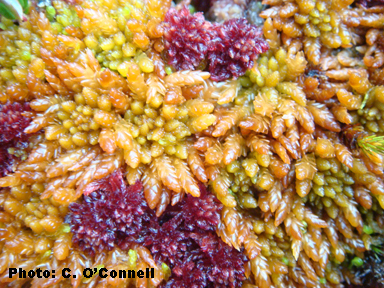 Each species has a unique colour and together they can form a richly coloured mosaic or carpet on the bog surface. The scarce bog mosses Sphagnum fuscum and S. austinii are found at the centre of the bog. 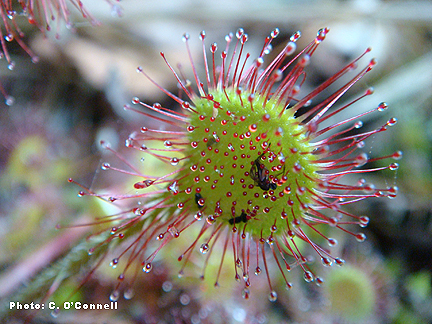 The insectivorus plant Great Sundew (Drosera anglica) and the Round-leaved Sundew (see above Drosera rotundifolia) are also found. These plants get nutrients by ingesting insects that they trap on their sticky leaves. Many species of lichen can be found on the bog. They belong to the genus known as Cladonia. Lichens are ancient and simple plants that result from a symbiotic relationship between fungus and bacteria. They form many interesting shapes including antler horns, pyxie cups, matchsticks and bearded types. The presence of the lichens is an indication that the area is free of air pollution. Snipe and skylark are the two birds most often seen on the high bog. Snipe rise from the dense heather vegetation with a startle and zig-zig away over the bog. Skylark are most obvious in the middle of summer singing their incessant and tuneful song as they hover high above the bog. 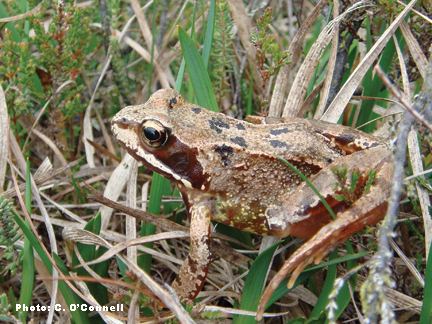 Frogs (Rana temporaria) are common on Girley Bog while Badgers, foxes and hares are sometimes seen criss-crossing the bog as they forage for food. Many of the people who had turf cutting rights on this bog decided to sell up to the National Parks and Wildlife Service in the period from 1999 when Sile de Valera TD announced the first compensation package for the Derogation on Turf Cutting. NPWS got into negotiations with the last turf cutter who was operating semi-commercially. They offered him €3000 per acre for his land holding. However this was during the Celtic Tiger period and quite suddenly there was no money to buy him out. IPCC were approached by Maurice Eakin, District Conservation Officer with the NPWS as he knew about the Dutch-Irish bog buying days. He asked us to purchase 21 acres of raised bog and told us that he was approaching another NGO, the Native Woodland Trust who agreed to purchase the a further 17 acres of green field and woodland surrounding the raised bog owned by the same turf cutter. Having reached agreement and signed contracts we are all hoping to work together with the National Parks and Wildlife Service to conserve the site. 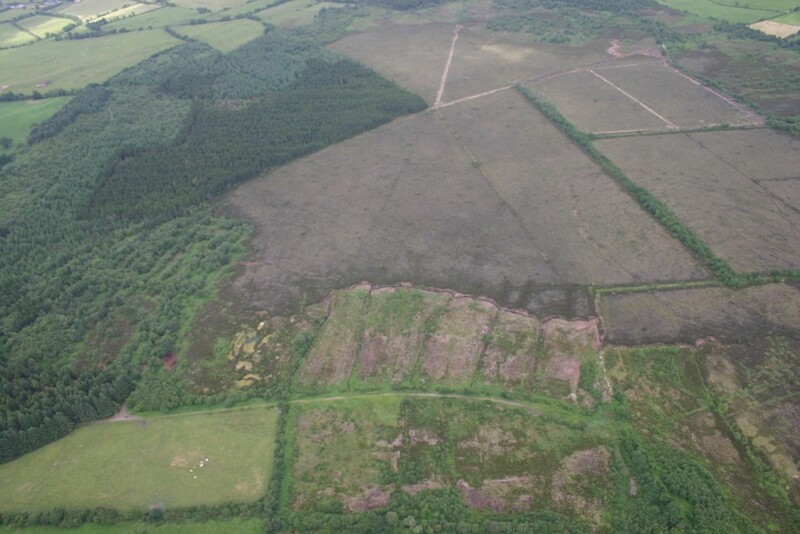 The air photograph opposite of Girley Bog shown opposite shows the different threats to the site including forestry planting on the high bog dome, drainage across the bog and on the perimeter, peat removal from the perimeter and turf drying on the cutover bog areas. Photo courtesy of the National Parks and Wildlife Service. Another owner of Girley Bog is Coillte. They planted conifers on part of the dome of the bog in historical times. Conifer trees affect the hydrology of bogs negatively. Coillte were awarded an EU Life funded project to remove the plantation and block the drains they inserted into the bog. This work was undertaken in 2012. There are further plans to build a boardwalk on this site which will be one of the demonstration sites for the EU Life Project. During 2012, Action for Biodiversity, an INTERREG IVa project operating in the East Border Region in co-operation with 10 local authorities, including Meath County Council commissioned Ray Flynn from Queens University in Belfast to undertake a hydrological study of Girley Bog. Dr Flynn assessed the bog and came up with a cost of €35,000 to block drains and to monitor hydrology across the entire site. The result of this work would be to conserve the core wet, Sphagnum-rich area of Girley Bog. The funders of this research were the Special European Union Programmes Body (SEUPB). 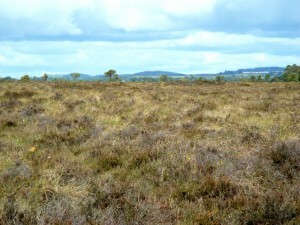 Girley Bog has a significant core area that is rich in Sphagnum Mosses shown in this picture. The presence of a thick living layer of these mosses on a bog coupled with a high water level is indicative of active peat formation in the peatland. At Girley the conservation of the core Sphagnum-rich area will be a priority action for conservation managers. Work involves raising the water levels in the high bog surrounding the core conservation area as this is regarded as supporting habitat, removing invasive pine and birch trees from the bog surface, preventing fire, monitoring water levels and restoring Sphagnum moss growth to suitable rewetted areas of the cutover bog. Girley Bog Meitheal is a management group involving the many different stakeholder in the bog. This group developed a conservation action plan for the site in 2015, led by the IPCC. 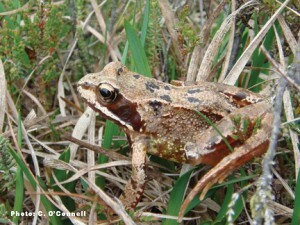 The Plan aims to conserve the unique habitats found in Girley Bog and to enhance their wildlife and to provide a quality amenity and education resource in the bog. The Conservation Action Plan has a 10 year life span from 2016 to 2025 and provides a template for work to be done on the site in the coming decade. There will be huge opportunities for volunteers to help with the work. This will include drain blocking, habitat creation and enhancement, site monitoring and maintenance of the Girley Bog Loop Walk. Walking pets (without a lead), camping, fires and the use of motorised vehicles on the bog are prohibited as they disturb wildlife. It is dangerous to walk on the bog surface owing to hidden ditches, soft ground, tree stumps and brambles. Please use the loop walk trail provided. If you would like to support IPCC’s management work on Girley Bog please follow this link.